Waiting for the Big Bottom Wetting. Now, should that be big-bottom wetting? Or big bottom-wetting? Whichever, we’re here outside Bridgewater Boats on the Grand Union near Watford, eagerly anticipating the great event. 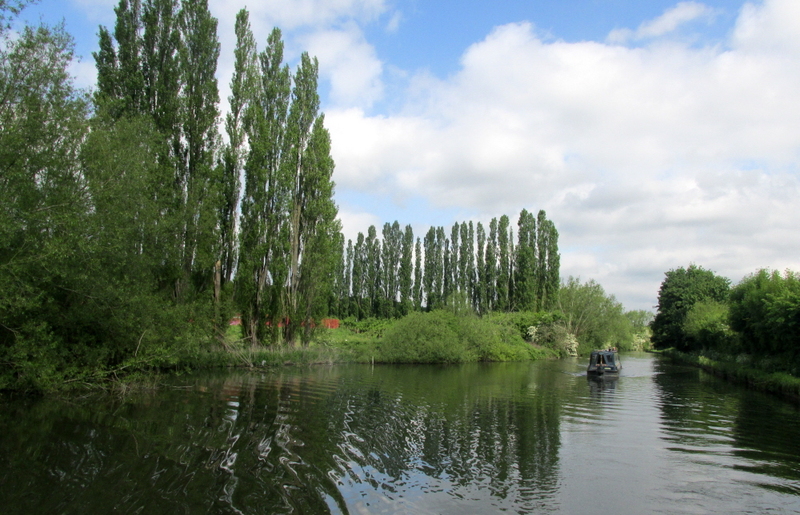 We set off from our mooring near Hunton Bridge on Friday, aiming to finish up close to Bridgewater Basin. An unusual narrowboat modification, weld a VW Tauran on the back-end! Not sure if the wheel is used for steering, if so I hope it’s got a sunroof, ‘cause there’s no way to see from the drivers seat! The two Hunton Bridge Locks were not far away, and we were lucky to have them both in our favour. This whole stretch of canal is pleasant, with the canal and the River Gade sometimes sharing a course, sometimes alongside each other. I think we know this boat, it has a large picture of the fabulous Marilyn Monroe (aka Norma Jeane Mortenson) on the side. Not sure of the origin of the name Lady Capel, given to lock, wharf and bridge along here. It could be a corruption of Lady Chapel, a place of worship dedicated to Our Lady, the Virgin Mary. I can’t find any any reference to a church or chapel on the canal here, but it’s the most likely suggestion. The modern word chapel has it’s roots in Medieval Latin, Cappella. The ornamental bridge was ordered to be constructed by the 4th Earl of Essex, as part of the agreement to allow the navigation to cross his estate. By a happy coincidence, his name was William Anne Holles Capell. (Odd second name, but we are talking aristocracy here!) There’s the Capel connection! He had two wives, Frances and Harriet, and two female children, Elizabeth and Frances, any of which the bridge, lock and wharf could be named after. He died in 1799, shortly after the canal was constructed. Originally built for the GUCC and paired with butty Balham, she was one of Harland and Wolfe’s boats from Woolwich, launched in 1936. The canal is very shallow between the two Cassiobury Park Locks and Iron Bridge Lock. I got us well “stemmed up” while giving a couple of work boats the main channel. A bit of to-ing and fro-ing got us off again. We pulled in just above Cassio Bridge Lock, intending to hang around here until the arrival of Tubby. But once again it’s shallow, made worse by inconsiderate boaters who can’t be bothered to shut lock gates or drop paddles. All day Saturday we alternated between level and leaning, and on Sunday morning we woke with a considerable list to the left. The pull-cord for the bathroom light acts as a plumb-bob! …and headed for a mooring still breasted up. I explained to Sue that it would be a good idea, as she’s got to get used to steering a wide beam! We’ve plenty of water beneath us here, but above us is the line from Watford Railway Station, and a favourite roost for the local pigeon population! Still, at least we’re level! Sue has toddled off to Collingwood Boats again today, she’ll have some news to impart here, later, I expect. Only one more day’s cruise now to Bridgewater Basin near Watford. But we’re a little early as it turns out… Still it means that we can relax for a bit. Tuesday we cruised through Hemel Hempstead, and very pleasant it was, too. One of the Apsley Locks, top, middle or bottom, not sure which! There are more and more wide-beam boats as we get further south. This one, though, is particularly wide! Appropriately named, too! Thirteen and a half feet makes her a snug fit in these locks. We dropped down Nash Mills Lock, then Red Lion Lock, pulling in not far below. The parish, between Apsley and Kings Langley, is known as Nash Mills, named for the mill that stood here alongside the River Gade, now the Grand Union Canal. A corn mill in the 11th century, it became a paper mill in the 19th. A regular coal run to the busy mill, owned by John Dickinson, kept the boats busy. Dickinson’s had several paper mills along here and down to Croxley Green. Dependent on water for both power and the pulping process they were built alongside the Rivers Gade and Bulbourne, but the natural watercourses were drawn on by the canal. Lock use led to the river levels dropping, to the detriment of the mills. The canal company promised to build a reservoir to maintain a steady supply of water, but this didn’t materialise. Instead it was forced to pay Dickinsons and others huge amounts in damages, and to re-route a short section of canal that was notoriously leaky. The new route, now following the course of the Gade for a short distance, actually benefitted Dickinson threefold. The mill now had sufficient water for it’s operations, the new route, following the river bed, passed right by the mill, reducing transport costs, and Dickinson was awarded the contract for building it! Triple whammy! We took a day off yesterday. Well, a day off cruising, anyhow. No Problem’s old Eberspacher central heating boiler had gone terminal, so Sue had sourced a reconditioned Webasto to replace it. The afternoon was spent modifying the old installation to fit the Webasto, resulting in the satisfying roar of the thing firing up later in the afternoon. Back on board Seyella and desperate for a shower after spending a couple of hours curled up in NP’s engine ‘ole, the domestic water pump packed up! It turned out to be the pressure switch being dodgy, after getting water in. I got it going again, but I’ve now a replacement on order. And I got my shower! Today has been a lot warmer again after two chilly days. We had another short day, cruising to Hunton Bridge where, after several failed attempts, we managed to get Seyella close enough in to moor up. Kings Langley Lock, slow filling with no paddles in the new gates. As we get nearer the densely populated south-east the main roads, towns and railways start to converge on the canal. The M25 is passed just before Abbots Langley. Inside the London Orbital now! As I said, we pulled in near Hunton Bridge. As is becoming more of a problem with a shortage of dredging, our fairly deep draught means that although the fore-end is in, the stern often finishes up a foot of two from the bank. With the water levels going up and down an inch or two as the locks are used we can drift in when there’s depth, only to sit on the bottom when the pound drops again. Two holes in the boarding plank, one to take a mooring pin, the other large enough to drop over a stern dolly. Pinned out at an angle, and with a rope acting as a spring, the stern is held in position clear of the shallow bank with little movement as boats go past. Good, eh. And the plank is still useable for it’s proper purpose. 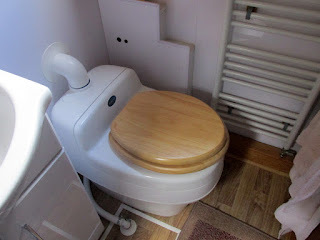 Oh, and another job was to fit a wooden loo seat. Mags was complaining that the plastic one was cold… It looks a lot better, too. Hi Ade, glad you’re enjoying the read. We aim to please…. Wil, now you know where to go if you want a Totem Pole of your own! Good to talk to you the other day. Hi Alf. Yes, I’ve done the same in the past, but I wanted something that I didn’t have to store when not in use. You know how it is, everything has to have at least two functions on a boat! Since last post, Locks 10, miles 7. A quiet weekend before we move on again. On Friday we had a short day, leaving Berkhamsted at around half-ten, tying up again by half-twelve. Sue and Vic were heading south for a grand-daughter’s eighteenth, and where we stopped was handy for a bus into Hemel Hempstead and the railway station. It was only a 5 minute trip to the first lock, Ravens Lane. On the offside, above the lock, was the centre of canal activity for the town. Boatbuilders, wharves and a coalyard were located here. Looking back at Castle Street Bridge, with the Berkhamsted Totem Pole on the left. The totem is a genuine Canadian tribal artifact, commissioned by the owner of the timber yard that used to stand here, and carved by Chief Henry Hunt, of the Kwakiutl tribe of British Columbia. Apart from being the (almost) birthplace of Francis Egerton, the “Canal Duke”, the town has another, earlier, claim to fame. Or infamy, in this case. It was here in 1066, that what was left of the Anglo-Saxon leadership surrendered the throne of England to the invading Normans. King Harold was killed at Hastings on the 14th October, and by the end of the month organised resistance ceased with the surrender. The new King’s half-brother, Robert of Montain, had the motte and bailey castle constructed. On a lighter note the town had the first sheep-dip factory in the country! Cruising through the town is actually very pleasant, the canal tree-lined and clean. Below the lock the infant River Bulbourne joins from the south. Bollards set in the bank of the stream suggest that it was navigable, at least for a little way. There was a smithy along here somewhere, and Cooper’s Lower Works was served by the canal, delivering coal, sulphur and arsenic, and taking away the finished sheep-dip mixture. I pity the sheep! We topped up with water between Bridges 142a and 143, then pressed on, down Top Side Lock, under Bullbeggers Bridge (fantastic name, I wonder what the origin is?) and moored up. Boats coming up, having drawn a lock-full of water from the pound, then emptied the lock as per instructions. A boat heading in the other direction would expect to find a full lock, but no, it had been emptied by the opposing boat. So they, in their turn, had to draw another lock-full of water out of the pound. There were a lot of boats about on Saturday, and someone must have cocked up because we spent a fair proportion of the day leaning at a crazy angle having been deposited on the bottom. It wasn’t until later that the pound started to make up again. The problem was towards to back of the boat, the deepest bit, of course. So I devised a Heath-Robinson arrangement involving two ropes and a mop handle to keep the stern out from the bank. It worked, to a degree. This chap spent most of the day quietly chuckling to himself at our predicament and my attempts to resolve it. After a dull and occasionally damp weekend this morning was bright and sunny as we set off. In contrast to the pound we’d moored in, these below were brimming with water. We’d got off a little earlier than normal, we’d an appointment with Mr Tesco at Winkwell Swing Bridge. Of the four locks to Winkwell two were empty (as per instructions) and two were full and in our favour. So it wasn’t a difficult trip. Groceries and wine and beer (lots of wine and beer, it seems!) loaded, we set off again. Vic walked ahead to open the mechanised bridge. Not only finely curved, I imagine it’s effective at feeding smooth water to the large propeller. There were a pair of historic boats waiting to come up Winkwell Bottom Lock, so we were mob-handed as we dropped down. Corona and Raymond waiting to go up as we pull out. They’d been to the Rickmansworth Canal festival over the weekend, and were on their way to the crick Boat Show next weekend. All go, init! By the time he’d got down the ladder NP had drifted into the middle of the lock so up he went again! Another couple of locks saw us arrive at the top of Boxmoor, where we pulled in for the afternoon. A bit arboreal so we're shaded from the afternoon sun, but there are accessible meadows beyond the trees, fine for the dogs. After a glorious, sunny day we were treated to the mother of all hailstorms this evening. Glad we weren’t travelling in that! Berkhamsted, a Norman castle and the Canal Duke. We dropped down five locks into Berkhamsted on Wednesday – in the rain. We wouldn’t normally have travelled in such conditions, but Sue and Vic needed to be close to the railway station for another visit to their boatbuilder in Liverpool. It actually wasn’t too bad. Mags was under instruction to stay dry inside, but with the two boats in the locks it wasn’t a problem. We soon got into a routine. I’d take Seyella in then get off to lift a bottom paddle. Vic would do the other. Meanwhile Sue had taken a rope around a stud on our stern to stop Seyella moving around too much. With the lock empty Sue then motored out, towing Seyella out with the rope, then stopping just clear of the gates for the men to re-board their respective boats. Sue towing Seyella out of Gas 1 Lock. In this case we’d gone a step further, lashing the fore-ends as well for the short pound to Gas 2 Lock. The moorings were busy above Berkhamsted Lock, so we dropped down and pulled in alongside The Moor, an area of open parkland opposite the station. …and opposite us a newly hatched foursome of moorhens were sticking to mum like glue! Ugly little critters, aren’t they! In the afternoon Meg and I went for a look around Berhamsted Castle, although there’s not much left. Built soon after the Norman invasion, around 1070, it started out as a basic pattern Motte and Bailey, a conical mound topped by a wooden keep (the motte), overlooking a level compound (the bailey) with the whole lot surrounded by a defensive earthwork and maybe a moat. The motte, now missing the keep. The town was granted to Thomas Beckett in the 12th century, and it was during this period that the stone curtain wall and outer defensive rings of embankment and ditch were built. The curtain wall is still intact in several places, making the shape of the castle easily discernable. But the dressed stone facings have been removed for other buildings. The outer ditch has been destroyed to the south, by the building of Station Road and the railway, but the embankment remains. There’s a lodge against the remains of the south-east wall, a later addition built in 1865. The castle was abandoned in the 16th century and most of the decent building materials plundered. This was common practice going back to the Dark Ages. There are many farmhouses in Northumberland and (what was) Westmorland that owe their solid construction to stone “borrowed” from Hadrian’s Wall. And Newark Castle’s walls have been recycled into many of the town’s buildings. Moving on into the 18th century, and we come to the start of the canal age. The 3rd Duke of Bridgewater, Francis Egerton, was born in 1736 and raised on the family estate at Ashridge. About 4 miles north of Berkhamsted, the estate, now a National Trust property, sits in the Chilterns near Ringshall. Inheriting the title at the age of 12 on the death of his brother, the 3rd Duke was sickly and considered a bit dim. But he must have had a good business head on his shoulders. Impressed by the continental canals during his “Grand Tour” he realised that the same techniques could be used to improve transport of coal from the collieries on his Worsley estate to customers in Manchester. He employed a hithertoo little-know and self-taught engineer, James Brindley, to survey and build a canal. The Bridgewater Canal was opened in 1761 and was an immediate success. His name, and that of Mr Brindley, are irrevocably linked to the birth of the English canal system. The Duke, who died in 1805, would have been delighted to see the Grand Junction Canal reach his home town in 1798 and Berkhamsted becom a major port on the inland waterways. Sue and Vic arrived back yesterday evening, with plenty of news about how well the build of No Problem XL is going. In the afternoon Kevin and Ann, owners of NB Rock’n’Roll, turned up, having moored above Berkhamsted Lock. We had a chat, then invited them to join us, with Sue and Vic, in the evening. K&A have a delightful Staffie pup, by the name of Jaz. She’s a bit fussy at the moment, and kept getting warned off by the other three dogs sprawled about the saloon floor if she got too playful. But they all got on quite well. No relief from the damp, even underground! Back on the broad locks.